Akasha - Symbolising the fifth element with essential oils of Vetiver, Grapefruit, Lemongrass and Rosemary. Health Melt - A combination of dried St John's Wort and essential oils of Rosemary, Marjoram and Lavender (associated with good health, well being, healing and calm) and a hint of Clary Sage to help fight depression. Kitchen Witch - Banish unwanted cooking and kitchen smells. Contains essential oils of Lemongrass, Thyme, and Rosemary associated with purification and uplifting. Love Melt - Love thyself with the relaxing aromas of the essential oils of Rose, Palmarose and Orange. (melts with dried rose petals). 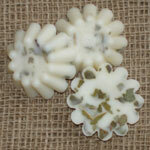 Midsummer Melt - Chamomile, Lavender, Lemon Verbena , Basil (melts with dried chamomile flowers). 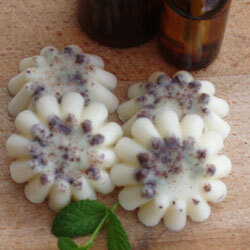 Moon Melt - Lemon, Camphor clary sage and a hint of sandalwood (melts with dried seaweed). Persephone's Dawn - A fresh green aroma with essential oils of Lavender, Jasmine, Lemon, Clary Sage (with dried lavender). Sun Melt - Marigold, Orange and Rosemary essential oils (melts with dried Marigold petals) to lift your mood.